However, good looks and marketing may be all these chews have going for them. They come in two flavors; Berry Blast and Citrus Blast. I decided to try Berry Blast, only because anything berry can’t be that bad, right? When I first opened the package, the first thing I thought of was Starburst. These chews look just like them and even had the same texture as a Starburst. 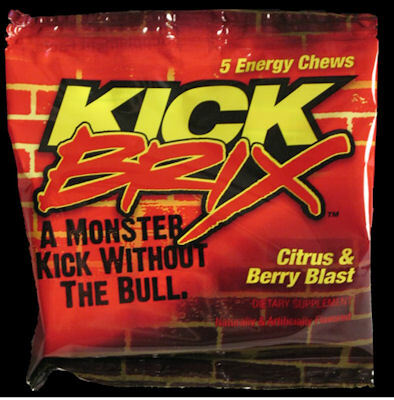 They were soft and chewy, but as I continued chewing, I immediately thought that Kickbrix tastes like something the dentist would give me just before getting a dental impression. It had a minty taste, and left a fresh gum-like taste in my mouth. The berry flavor was somewhere in there, but not very prominent. It also had a sour taste to it. While chewing, I noticed that it didn’t break apart in my mouth like some candies do. It reminded me of those wax bottles that I used to eat when I was young. I couldn’t chew it for very long because the flavors in this chew did not mix well together. I ended up spitting it out. But surprisingly,Â I didn’t have to wash my mouth out because as soon as it was out of my mouth, it felt like I had just brushed my teeth. I guess that minty taste worked in its favor. As for energy, I’m not sure if I didn’t chew it long enough or what, but I didn’t feel any sort of energy boost from it. My guess is that I would probably need to actually chew it for awhile and ingest it before experiencing any type of energy from this product, but I didn’t even last that long. Has anyone else tried Kickbrix? If so, what did you think? How would you compare them to any energy products that are on the market today? These sound very strange – in my opinion, mint doesn’t really go with anything but itself (chocolate excepted). I’ll be sticking with my morning cup of coffee. I kinda wish candy would stop trying to do anything but taste good… anywho, you’re braver than i for trying this candy. great article and welcome to staff! chews, . . . Bam: I’m on. Eyes wide open. Seriously. Wish they tasted more like candy but they don’t.